What to cook for someone who doesn't eat four legged animals? Guess I have to throw that shepherd's pie and spaghetti bolognese recipes out the window. I don't love fish all that much but miso cod is the exception. It's pretty simple and quick if you follow this recipe that I found online, with slight modifications. You can also choose to broil the fish which will yield a caramelized coating but this preparation is good if you are worried about drying out the fish. Use parchment paper or banana leaves instead of foil for a better presentation. For some starch, I decided to make Soba noodles with shiitake mushrooms. It's pretty simple, quick and is great for leftovers. I used chili garlic sauce which gave the noodles an added punch. Marinate the cod overnight with the miso marinade. Cut up eggplant into pieces and soak them in water with a little salt for an hour. Remove and dry. Layer eggplant onto parchment paper or foil and lightly season with salt. 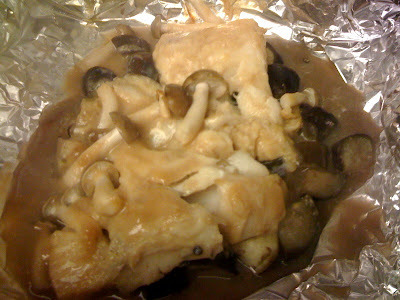 Place the fish on the bed of eggplant, green onions and top with mushrooms. Wrap everything up en papillote, and bake it in the oven (400°F) for 12-15 minutes. Saute the minced ginger and garlic in oil until they're softened. Add the mushrooms and saute until they're brown. Add about half the sauce and saute until it's reduced. While the veggies are cooking, boil water for the soba noodles. Cook the noodles and the edamame together until the soba noodles are al dente, about 6 minutes. Drain the noodles and edamame then toss with the rest of the sauce. 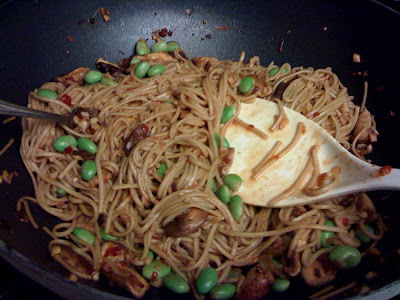 Mix everything (soba, edamame, veggies) together.